I was given for Christmas a DVD collection of Bette Davis films. (Not sure why - I'm not really a fan of hers.) I watched one of them recently - The Virgin Queen (1955), which is all about the relationship between Queen Elizabeth I (Davis) and Sir Walter Raleigh (Richard Todd - who is excellent). 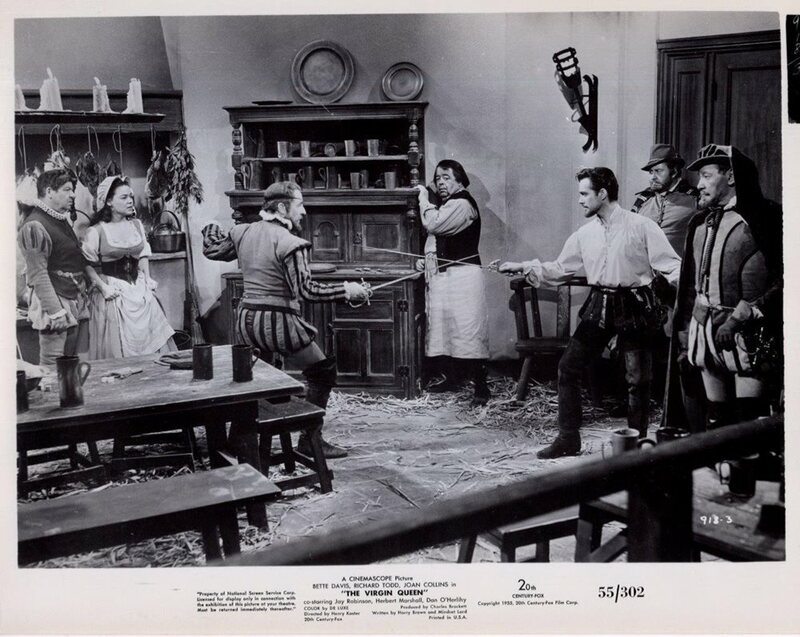 Throughout the film (which had a fair amount of swashbuckling action), Sir Walter and most of the other 'men of substance' wear thigh boots in nearly every scene. Although the boots are flat, they are close-fitting and long (typically approaching crotch-high) and in black leather, brown leather or brown suede. Interestingly, Joan Collins also appears (as Sir Walter's lover and later wife) but wears no notable footwear. I don't know how accurate the costumes were. Thigh boots were certainly worn by men at this period, mainly for riding or as part of a uniform so perhaps not as frequently as in the film suggests for other activities. But it was good to see them 'in action'. There was recently a late 15th century skeleton found in a construction site near the Thames, still wearing the pair of thigh boots he had been wearing when, apparently, he drowned. It is believed, from evidence provided by his skeleton, that he was either a fisherman or a sailor. Several pair of thigh boots were also found in the wreck of the Mary Rose. The 15th century thigh boots found on that skeleton are the oldest thigh boots known. Although simply made, and unadorned, they would have been expensive at the time. At that point in time - late 15th century - boots in general were fairly rare. They came into their own over the next century or so.